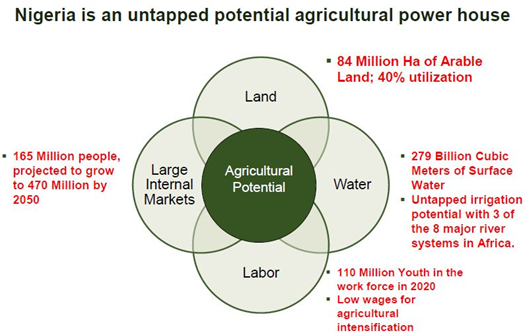 Agriculture remains the dominant sector in the rural areas of Nigeria providing employment for about 60% of the work force.The diversity of climatic conditions, the richness of soil types and water sources, and the high population density provide great potential for crop, animal, fish, and tree production. In the 1960s and up to the early 1970s, Nigeria’s agriculture flourished with the country being one of the world’s highest producers of palm oil, cocoa, and groundnut. Overtime, agriculture has declined in importance. However, through the platform of the Agricultural Transformation Agenda, the current government is taking giant steps towards an active sustainable revitalization of the agricultural sector with a view to curb the looming food insecurity, unemployment, and economic issues. It intends to achieve these by encouraging private sector participation, absorb labor through the intensification of agro processing operations and by taking advantage of the foreign earnings that could accrue from the exportation of agricultural products. A plethora of research work has been carried out by the Ministry of Agriculture and Rural Development, IITA, FAO, CBN, and other bodies showing the trend of the agro industry and its embedded prospects, some of which are presented here. 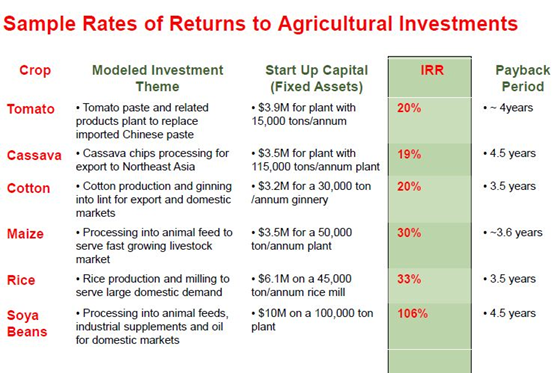 The analysis below indicates that over the years, there have been increasing demands on the international market for our agricultural commodities. 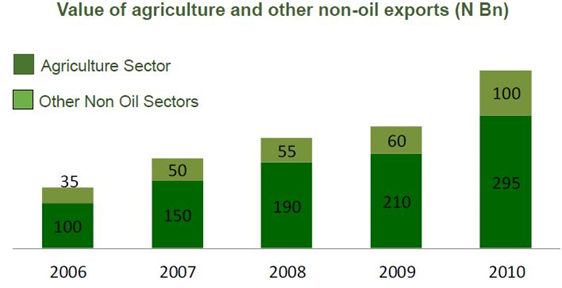 In 2010, out of the total value of non-oil exports, the agricultural sector had a whopping 75% contribution in value. 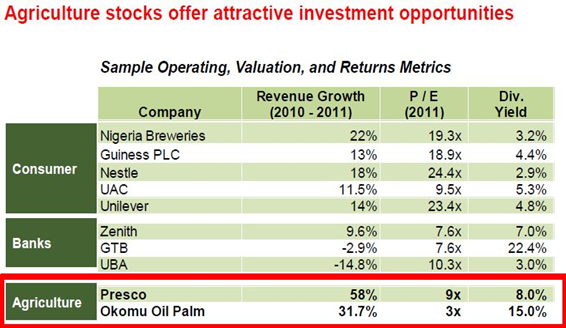 Due to the rising trend, it is expected to increase subsequently, presenting a huge opportunity for investment. There is gross under-utilization of the resources and factors of production in the Nigerian agro sector with both effectiveness and efficiency below par. 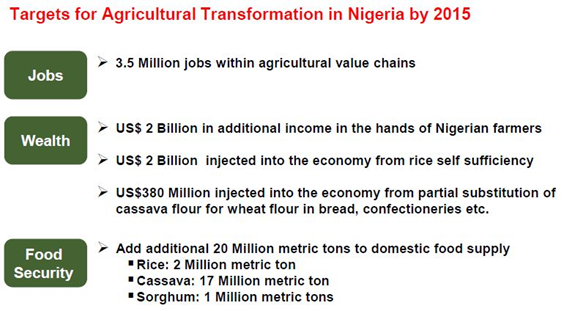 The typical Nigerian agricultural sector is described as an “effective non-efficient” industry. Effectiveness talks about the ability of an input to be transformed to an output while efficiency takes it a step further to measure how well the input is converted to output in terms of productivity. One of the setbacks the oil and gas industry faces is the lack of adequate refining facilities in the country prompting the producers to export our crude oil for refining. The refined products come back to us as “breadcrumbs” with lesser monetary value than would have been if we had refined within the shores of the country. The agro sector is having its share of this malady with it’s over dependence on importation of commodities that are capable of being grown and processed in the country. This has a ripple effect of creating unemployment, reducing house-hold income, impairing affordable domestic food supply, and making the contribution of the agro sector to the economy come in trickles. The Agricultural Transformation Agenda might be a light at the end of the tunnel as it seeks to ameliorate the current situation in the industry with a view to foster economic development and sustainability by reducing to the barest minimum our dependence on importation. In view of this, a huge investment window has been opened for private sector participation in achieving this unified goal. A classification of Nigeria into zones reveals that we can utilize the inherent comparative advantage.A zone has a comparative advantage at producing something if it can produce it at lower cost than any other place. The figure below is a mini-classification of some agricultural produce matched against zones of best yields. 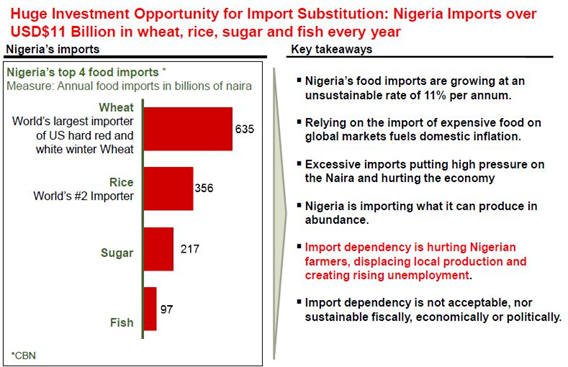 Nigeria is world’s highest importer of wheat. At the current growth rate Nigeia will be importing 17 million MT by 2020, the equivalent of the entire exports of the 3rd largest exporter, Canada. In addition to wheat and sugar, cassava can also be a substitute for corn starch currently imported to Nigeria in significant quantities. With these facts, it becomes imperative that the revitalisation of the agro sector should not be left to the government alone. It calls for a concerted effort from private sector to take advantage of the emerging potential and opportunity to create value and inturn enrich their coffers. 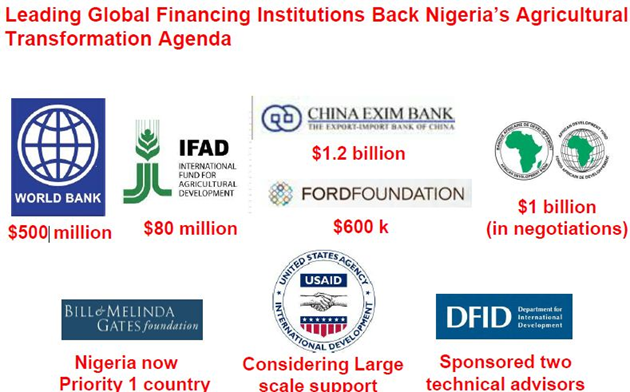 It is no news that finance is one of the obvious limiting factor deterring the acceleration and development of the agro industry, and a major contributor to the enduring subsistence level of agriculture among peasant farmers. 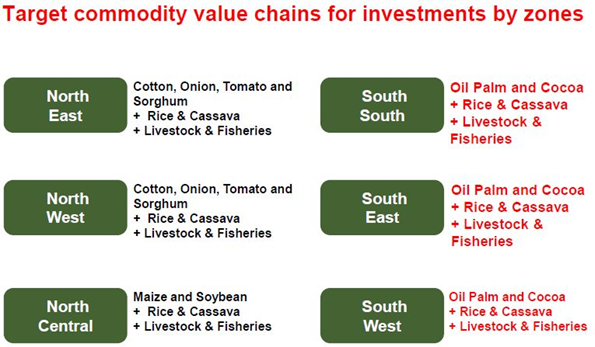 Due to lack of sufficient information, most investors do not have a grasp of the economic potential and profitability of the agricultural sector to enable them make informed investment decisions.A look into Nigeria’s capital market indicates that agricultural stocks compete favorably with those from other sectors. 1. Zero percent duty on agricultural machinery and equipment imports. 2. Removal of restrictions on areas of investment and maximum equity ownership in investment by foreign investors. 3. No currency exchange controls- free transfer of capital, profits and dividends. 4. Constitutional guarantees against nationalization/expropriation. 5. Pioneer tax holiday for agricultural investments. 6. Infrastructure support, with special focus on staple crop processing zones, for power, water and electricity.